HomeBlood BowlBlood Bowl – Am I too late for kick off? Games Workshop recently announced the Chaos Doom Lords as a Blood Bowl team. 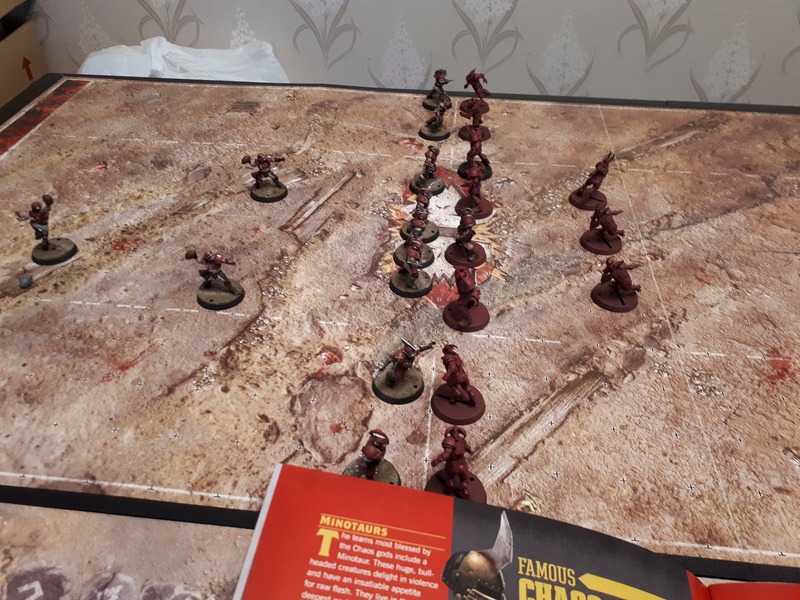 This was the first box to tick for me as I’m a Chaos player through-and-through. The models look great with wonderful, dynamic sculpts without looking too cartoony. I grabbed a box of them and figured now would be the time to give it a go. 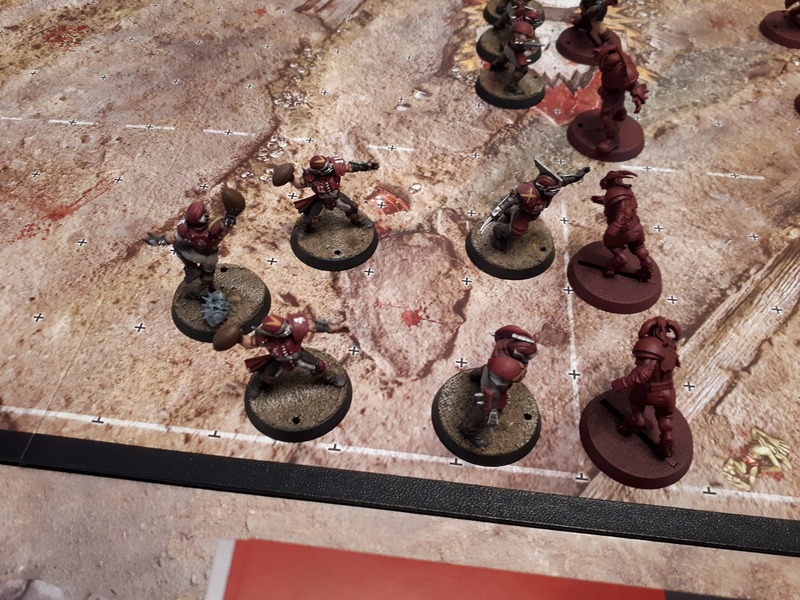 I arranged with a fellow tabletop player who was experienced in Blood Bowl to run me through the game. I’ll offer you a quick run-through on how the game is played and include my thoughts on it. The sampler game saw my Chaos Doom Lords go against my opponents human teams call “The Kislev Kons”. A bunch of convicts forced to play the sport for their freedom. This already makes me feel good about the game as this is the sort of stuff I love. My opponent even brought his team’s coach. This coach can make an impact in the game, so I’m told. He can even help a player on his team make a foul and get away with it, which is nice! The objective of the game is to score touchdowns, whoever gets the most by the end of the game wins. However, I wanted to play aggressively as this felt more Chaos-esque. I sought victory via the most merciless means possible, touchdowns would be a bonus! The “Kislev Kons” human team with their coach named Diddus Poppus, alongside Head Physician and Chief of Morale, Jules (the Cudgel at his side…). Anyway, on to the game. The game started with our teams set up on the board and it was decided that my team would kick the ball. The Kons would receive the ball and start first once the ball had scattered/landed after the kick. We rolled for weather and rain had started before the game, meaning catching, intercepting and picking up the ball would be more difficult. Upon grabbing the ball the Kons formed a half-cage, having the handler covered by fellow Kons. This would make it more difficult for me to block him and take the ball. After activating a load of his players, my opponent fumbled one of them, rolling so low the player fell over! This then caused a “Turnover” which means when a team makes a mistake it then becomes the opposing players turn. These Turnovers proved very unforgiving (especially for the Kons) as this saw them fumble and fall regularly early on in their turn. This means fewer of his players performed actions than could have. It felt best to then play it safe…by having my team knock ten bells out of as many of his guys as possible! This was achieved via “Block” actions, which act as attacks. I also used “Blitz” which allows your players to run and attack an enemy model, thought you can only do this once per turn. I was very lucky with my rolls, either pushing a lot of his models back or knocking them down. This deeply hindered his options on what he could do on his next turn. Once I had finished activating all my players, we then proceeded to the next turn. The Kons then tried to throw the ball further down field, having my team get more defensive. However, despite the poor weather a Beastman Runner of mine was able to intercept the ball and grab it! This instantly caused yet another Turnover and so I started running my guys as much as possible further forward. Over the proceeding turns we saw numerous humans get bashed into the ground, some becoming too injured to play on! One was unfortunate enough to get pushed off-board and into the crowd which instantly breaks their armour and they were then injured. Once players are knocked out or injured they are moved to the dugout, an area off the main game board. A fairly standard setup for a Blood Bowl kick off. A nice, tough scrum line with some players further back ready for the catch! My Chosen Blockers, who are big hulking Chosen of Chaos, performed well in stopping the human advances. My team was very fortunate to not fumble anywhere as near as much as my opponent did. The consensus seems to be if you have an action that uses a single die, then don’t do it. You can support some actions with more adjacent friendly models or stronger players that allow you to roll more dice, so it works for your players to support each other. I had to sacrifice one of my other Beastman Runners to ensure the one who had the ball could get to the touchdown line. I ended up knocking out two of the Kons and three of them were severely injured. My runner made it to be one square short of scoring. However, my player was able to make a “Go for it! roll” which allows them to move one additional square. I succeeded and scored the touchdown! 30 minutes had passed (with many conversations and questions taking place throughout) we decided that we had gotten the core of the game down and called it there. It was a frantic but fun bitesize chunk of Blood Bowl. 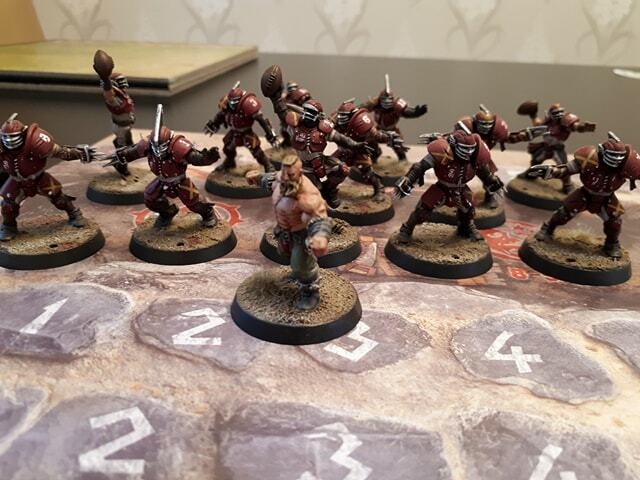 Positioning can make or break a game of Blood Bowl for you and your players. Keep them close together to improve your odds of success! Send me back in, coach! Admittedly, American football could not be further from my interests, even “soccer” is a stretch. But this game was genuinely fun. I can certainly see the appeal of building a team with a background and additional characters. It’d be heart-breaking to see my star player of 12 games get literally murdered on-pitch but that’s part of the fun. A fear of mine was that the gameplay would put me off at first, but it’s actually got some quite fleshed out systems. There’s enough tactical flexibility that mean you could quickly culminate strategies but the dice will always be the decider, keeping the game fun and exciting. I’m already considering names and progression plans for my Chaos guys will soon have their own team name! If, like me, you thought you’d not make it to the starting whistle for Blood Bowl, I’d not hang up your boots and helmet just yet. Find yourself a player to coach you and throw some pigskin…or squigskin, I suppose? There’s plenty of things to get stuck into within the rulebook, it’s just a shame that the physical copy is only available with the whole Blood Bowl box. Will absolutely look into it, thanks for the heads-up!